Man Kills Snake; Snake Tries To Kill Him Back Trying to save his wife from a diamondback rattler, Jeremy Sutcliffe decapitated the snake with a shovel. But when he went to pick up the head, it bit him — delivering a near deadly dose of venom. A diamondback rattlesnake â not this one â injected a Texas man with a dangerous dose of venom even though it had been decapitated. The man is in stable condition. The story has a semi-biblical tone: A man and woman together in a garden come across a serpent. The serpent awakens them to their own mortality and their lives are changed forever. 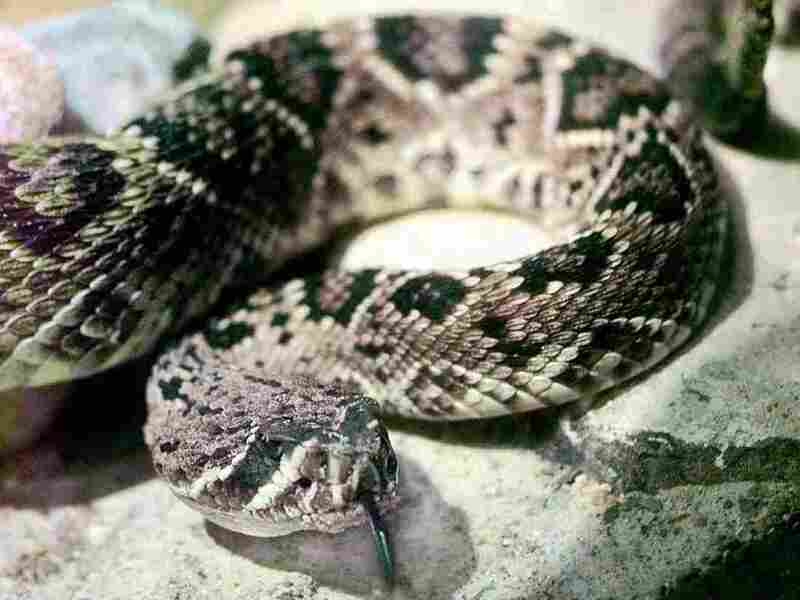 But that's where the similarities end, because in this story, the man grabbed a shovel to decapitate the snake — a 4-foot-long Western diamondback rattlesnake — after it spooked his wife. And when he went to pick up the severed head, it sank its fangs into his flesh and released a near deadly dose of venom. Jennifer Sutcliffe — who happens to be a nurse — told KIII TV she jumped into professional mode after her husband, Jeremy, was bitten. She got him into the car and called 911 to find the nearest hospital to Lake Corpus Christi in Southern Texas that had anti-venom medication on hand. It was an hour away, Sutcliffe told The Washington Post. About 2 miles into the drive her husband began having seizures, lost his vision and, unknown to them, began bleeding internally. So she met up with an ambulance and then a helicopter, which flew the 40-year-old to the hospital as his organs were already shutting down. It was touch-and-go for the first 24 hours, according to Sutcliffe, but he is now in stable condition. "A severed viper head certainly can deliver a dangerous bite, as can the unsecured head of a recently 'killed' snake," Harry Greene, a herpetologist and professor of ecology and evolutionary biology at Cornell University, told NPR. "When I pick up a road-killed rattlesnake to preserve as a museum specimen, for example, I always lay something heavy across the neck while I'm injecting formalin into the body, to insure that the head not snap around and get me," he said. To get a sense of Greene's tone, it is important to note that his email signature includes a self-made meme with a picture of himself coaxing a rattlesnake into a long clear tube and the phrase, "Yeah, sure ... 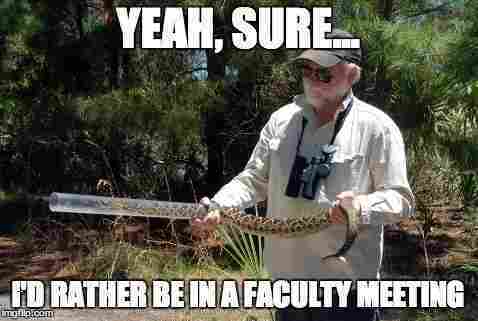 I'd rather be in a faculty meeting." He also dismissed questions about his own snakebite experience some years back: "It was only a little copperhead and he was small and he only got me with one fang," he recalled of the experience. There seems to be some dispute about exactly how long a beheaded snake can remain active. Gizmodo reported one anti-venom doctor worked on "a case where a someone was envenomated by a mummified snake head years after the reptile died." But Greene suspects the typical rattlesnake can keep moving for a few hours at most after it is split in two. In fact, he said, "If you left the dead head there long enough the venom would degrade. The head would be rotting and the venom would no longer be dangerous." He described a viper snake's head as analogous to a hypodermic needle. "The venom gland is the barrel of the syringe. The fang is the needle. And the plunger is the muscle that compresses the gland and squirts the venom out of the fang and into the victim." Based on the reports of Sutcliffe's harrowing injuries, Greene suspects he was injected with a powerful dose of venom. Living snakes typically strike quickly and rear back from whatever threat they perceive, but because the one in this instance was dead, it most likely latched on until someone forcibly removed it. It should go without saying, he said, but no one should be trying to pick up a rattlesnake, dead or alive.